Tango Emoción…an original production bringing together song, dance and passion, currently on European tour with the participation of mezzo-soprano Oana Andra (Romania). Tango is a peculiar phenomenon, fascinating, enticing, and full of passion. For many, the very way of living, being ritually transported into their very reason of existing... That creed of intense burning of the entire inward nature has deeply impressed the author, Romanian mezzo-soprano Oana Andra, who has written a passionate scenic story named “Tango Emoción”, based on 17 well-known tangos, from Carlos Gardel to Astor Piazzolla. Currently the production, premièred at the National Opera House in Bucharest in 2010, is on European tour, with its only performance in Malta to take place on Friday 26 October at Kempinski Hotel San Lawrenz as part of the 11th edition of Festival Mediterranea, organised by Teatru Astra. In 2013 the production moves to Bulgaria and Austria. 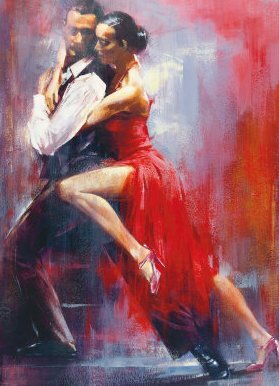 Tango Emoción represents a love dream, eternally possible, eternally desirable, an escape from an ugly reality full of aggressive impersonal rhythms to a world of the intense living, in which there is no loneliness but where the other one is always present in one’s soul. The performance is mainly based on the artistes, on their human, vocal and bodily expression. They sing, recite, and dance Argentinean tango in a spectacular and temperamentally-charged performance. The audience is placed right in the middle of the action to live the development of all events with the protagonists. Since its première, Tango Emoción has been performed to sold-out theatres and excellent reviews. The production was selected by the Argentinean Ambassador in Romania himself to celebrate the 200 anniversary of Argentina’s Independence in May 2010.